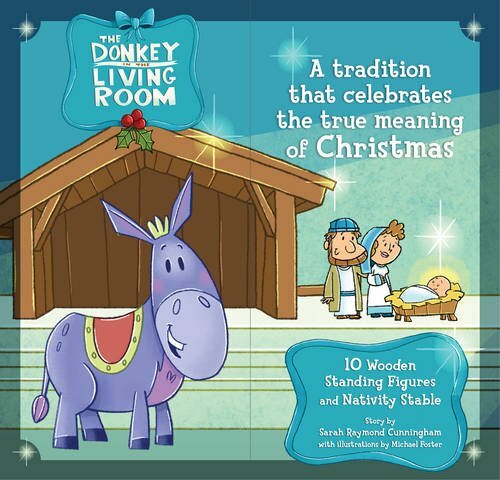 Begin a new family tradition this Christmas with The Donkey in the Living RoomNativity Set and picture book! The beautiful keepsake box opens to form a stable scene, and nine nativity pieces are waiting to be placed around the manger as you count down to Christmas. As you read the book, children will learn the true meaning of Christmas through individual stories of the characters present at Jesus’ birth—the Donkey, Cow, Sheep, Shepherd, Angel, Camel, Wise Men, Joseph, and of course, baby Jesus. On each of the nine days leading up to Christmas, introduce the story of a new character, unwrap that character's piece from the nativity set, and share a new appreciation for the advent season. Set includes: Picture book, keepsake and storage box that unfolds to create stable scene, and nine nativity pieces. Also sold separately: The Donkey in the Living Room picture book (978-1433683176).